Given the highest Tier 1 ranking in the Best Lawyers - U.S. News "Best Law Firms" list in the area of Personal Injury Litigation (2016-2018). 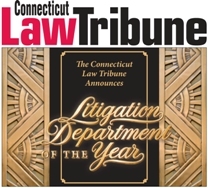 Named 2013 Connecticut Insurance Litigation Legal Department of the Year by Connecticut Law Tribune. Named top mid-size litigation firm in Connecticut by Super Lawyers® Business Edition for four consecutive years (2011-2015). Given the highest Tier 1 ranking in the Best Lawyers - U.S. News "Best Law Firms" list in the areas of Medical Malpractice and Personal Injury Litigation (2010-2015). Ten of our attorneys are listed in 2014 Connecticut Super Lawyers®: Charles A. Deluca, Robert C. E. Laney, Michael T. Ryan, Daniel E. Ryan, III, Kevin M. Tepas, Catherine S. Nietzel, Jamie A. Mahar and Janice D. Lai. Attorney Beck S. Fineman appears on the Rising Stars list. Super Lawyers recognizes Charles A. Deluca as one of "The Top 10 Connecticut Super Lawyers" and he also appears on their New England Top 100 list. Daniel E. Ryan III is listed in Top 100 New England and Top 50 Connecticut Super Lawyers. Charles A. Deluca, Daniel E. Ryan III, Michael T. Ryan and Robert O. Hickey are listed in The Best Lawyers in America® for 2015. Robert O. Hickey named 2015 "Lawyer of the Year" by Best Lawyers'2014-2015. American College of Trial Lawyers Charles A. Deluca and Kevin M. Tepas have been inducted as Fellows of this most prestigious body. American Board of Trial Attorneys Charles A. Deluca, Daniel E. Ryan III, Kevin M. Tepas and Catherine S. Nietzel are all members of ABOTA. Federation of Defense and Corporate Counsel Charles A. Deluca and Michael T. Ryan have been invited to become members of the FDCC. International Association of Defense Counsel Charles A. Deluca and Janice D. Lai are members of this invitation-only association of defense counsel. Robert C. E. Laney is a member and State Chairperson of the ADTA. Trucking Industry Defense Association Steven H. Malitz is an invited member of TIDA.